In 1965, the Great Smokey Hiking Club announced the start of the Cumberland trail at McLean Rock. 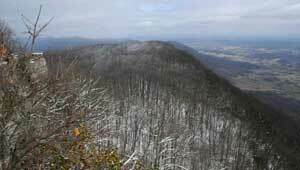 In 2010, TPL acquired the property from Molpus Timberlands, adding a critical 19 miles to the Cumberland Trail State Park, a 300-mile corridor stretching across 11 counties. Upon completion—150 miles are currently open—the state's only linear park will link the Cumberland Gap National Historic Park to Signal Point near Chattanooga.